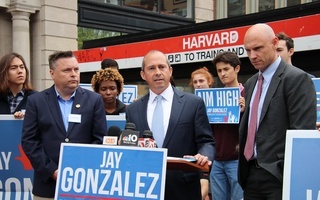 Gubernatorial Candidate Jay Gonzalez held a press conference at the Harvard T Stop to propose an endowment tax that would cost Harvard half a billion a year. 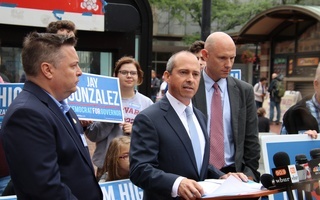 Jay Gonzalez, the Democratic candidate for Massachusetts governor, said he is proposing an endowment tax that would cost Harvard over $500 million per year at a press conference held in the Harvard T stop Wednesday. Gonzalez’s plan would levy a 1.6 percent tax on private, non-profit colleges and universities in the state whose endowments total over $1 billion. Harvard would qualify, as would four of its fellow research institutions — MIT, Tufts, Boston University, and Boston College. The four other affected schools are small liberal arts colleges Wellesley, Amherst, Williams, and Smith. Harvard and other peer institutions’ endowments, however, will be taxed at the federal level following Congress’ recent tax reform bill which Republicans pushed through in Dec. 2017. That bill, opposed by the entire Massachusetts Congressional delegation, levied an unprecedented endowment tax on some of the nation’s wealthiest private universities, including Harvard. Administrators estimate that, if the law had taken effect during fiscal year 2017, it would have cost the University $43 million. Comparatively, Gonzalez’s plan would have cost Harvard over $500 million had it taken effect in fiscal year 2017. Gonzalez said he would use the money generated from this tax — which he estimates will generate $1 billion per year — to fund public education and impove transportation. He said he does not yet know how the money “would be allocated” among various initiatives. The 1.6 percent tax would still allow “the schools’ endowments and wealth to grow over time to support their own purposes," Gonzalez said. He noted that no other states currently tax the endowments of private universities. Asked about Gonzalez's proposal, Harvard spokesperson Melodie L. Jackson pointed to a statement released Wednesday by the Association of Independent Colleges and Universities in Massachusetts. Members of the association wrote in the statement that Gonzalez's plan is "bad for students, bad for our economy, and bad for Massachusetts." "Through their educational and research missions, these non-profit institutions are drivers of our knowledge-based economy and provide the public good of a higher education, along with thousands of jobs and billions of dollars in spending, all at a tremendous savings to the Massachusetts taxpayer," the statement reads. Mayor of Cambridge Marc C. McGovern, who has endorsed Gonzalez, praised the endowment tax at Wednesday’s press conference. State rules set forth hundreds of years ago, though, could pose an obstacle to Gonzalez’s plan. Harvard’s tax-exempt status is written into the Massachusetts state constitution. That means taxing the University on the state level might require a constitutional amendment. “While they’re written into the constitution, I believe the proposal would be legal if we changed state law,” he said. Gonzalez's tax drew bipartisan backlash from some Massachusetts incumbents. His opponent, Governor Charlie D. Baker ’79, attacked the proposal for its similarity to the 2017 Republican tax reform bill. "I start with the proposition that when President Trump proposed this idea, I thought it was a bad idea then, and I still think it's a bad idea," Baker said, according to the Boston Globe. Democratic critics argued the proposed tax could cripple Harvard’s financial aid system. Senator Elizabeth Warren called the plan “completely backwards,” arguing that endowments are designed to support teaching and research, the Globe reported. United States Representative Michael E. Capuano, who recently lost his seat in an unexpected upset to Boston City Councillor Ayanna Pressley, warned an endowment tax could harm the construction industry, given universities employ workers to build their labs and academic centers. Joining Gonzalez on the gubernatorial ticket is lieutenant governor hopeful Quentin A. Palfrey ’96, himself the holder of two Harvard degrees and son to University mainstays and long-time Adams House faculty deans John G. “Sean” Palfrey ’67 and Judith “Judy” S. Palfrey ’67. Quentin Palfrey attended Wednesday’s announcement, though he did not speak. We believe that the money can be used for greater good at institutions of higher learning, and therefore believe that their financial well-being should be prioritized over that of corporations, at least in this situation. The proposed endowment tax would be a step back and would directly undermine Massachusetts’ strong higher education sector and all that it enables.